Overview : IMPORTANT NOTE: You must enable remote start to enable the power ON feature of this device. Currently, you must pair a PSP device with your PS3 before the remote start option can be enabled. So, you must obtain a PSP (or borrow one temporarily) to enable the power ON feature. However, the power OFF feature will work without remote start mode enabled. The PS3IR+PWR (Patent Pending) looks exactly like the PS3IRX1 and it runs an upgraded version of the same firmware. I have added the circuit necessary to simulate front panel touch events to allow for turning the PS3 ON and OFF. With this unit, the standard Sony DVD Power IR code can now be used to toggle the PS3 power ON/OFF. A small sticker must be applied over the front panel [0/1] touch key area. This sticker is connected to the device with a tiny black wire. The sticker has the same [0/1] graphic and matches the color and texture of the original front panel as much as possible. This area can still be touched to manually turn the PS3 ON and OFF. No modification of the PS3 is needed. The sticker can be removed later if desired. This device accepts PS2 and Sony DVD compatible IR commands and converts them to PS3 game controller key presses via USB. Plug it in and... It just works! For best results, program your universal remote control for PS2 mode and/or Sony DVD mode. Quality/Usability : Having reviewed the normal PS3IR that is just an adapter, I thought I'd give the "enhanced" version a try. I will be using my Logitech Harmony Advanced Remote which helps me eliminate the amount of remotes laying around. Unfortunately, the PlayStation 3 failed to help the cause. The PS3 does not use infrared (IR) but instead, uses bluetooth. If you are using a IR universal remote, there are different methods of using it. Sony released their own DVD remote for the PlayStation 2 (model SCHP-10150). When the PS2 first launched, the DVD remote included a IR receiver. As newer PS2's were released, the IR was built in and the dongle was no longer being packaged in. For those that is able to find one or still have the original PS2 DVD remote, you can use IR receiver and a PS2 to PS3 controller adapter, since the PS3 doesnt have PS2 controller port. Another option is to buy a 3rd party DVD remote that uses IR such as Nyko's Blu-Wave Infrared Remote but you spent all that money for a IR receiver and a remote you wont be using? Unfortunately, none of these options gives you the ability to turn on or off your PlayStation 3 from the comfort of your couch or bed. Like the PS3IRX1, the PS3IR+PWR is a IR dongle or receiver that connects to the USB port of your PS3 and allows you to use your universal remote but is connected to a sticker that goes over the [0/1] power button on the PS3. As mentioned above, I tested this nifty device with my Logitech Harmony Advanced Remote. 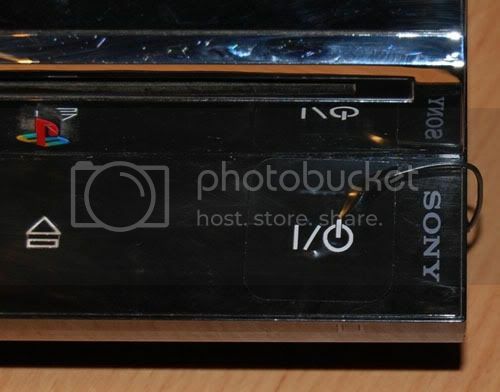 To set up the PS3IRX1, simply plug it into any of the USB ports on the front of the PlayStation 3. Setup is the same as the PS3IRX1. To setup the Logitech Harmony Remote, I simply connected the remote to my computer. Set up an "Activity" and "Device" and chose "Sony PlayStation 2". The reason I didnt choose Sony PlayStation 3 is since the universal remote does not use Bluetooth, choosing the PS3 wouldnt work and even Logitech says that the remote would not work. Choosing the PS2 also gives that message but ignore this message as their database is a bit outdated. If you are using a more complex and advanced controller, you are able to enter HEX codes to your controller. Choosing the PS3 instead of the PS2 only caused problems since none of the buttons really worked for me. Choosing the PS2, all the buttons were mapped. FF, RR, Chapter Skips, Play, Pause, Menu, etc. all worked without problems. What makes the PS3IR+PWR is its special feature. Yes! The ability to turn on and off your PS3. Other 3rd party remotes whether it be universal or dedicated PS3 remotes dont have the ability to power on and off your PS3 unless its Sony's Bluetooth Remote. This "hack" does not require any modding, soldering, tools and does not void your warranty. Well, I lied. The only "tool" you need is a Sony PlayStation Portable (PSP). Its as crucial as your universal remote as it is needed to help you remotely start your PlayStation 3. To setup your PlayStation3 for remote power on/off, you must go to the Settings Menu > Remote Play Settings > and register your Sony PSP. I know not everyone has a PSP but you have to know at least one friend or family who owns one. If you dont have access to a PSP, you can try and rent a PSP from Blockbuster or any store that offers this type of service. As mentioned above, you'll need the PSP to enable the Remote Start function. Once the PSP has been registered, turn on the Remote Start setting from the same menu as above and the Remote Start setup is complete. You're not done yet. That was just the easy part. Now its time for the hardware modification. This mod requires you to place a piece of copper over the PS3 control panel. Simply stick the larger copper piece over the [0/1] power button on the PlayStation3 and rub it. You'll see an indentation of the [0/1] on the copper. This is where it can get a little frustrating even though it looks easy. Take the thing piece of copper that is attached to the PS3IRX1 via wires and place half of it over the large copper piece that you applied to the PS3 previously. So instead of touching the [0/1] panel to turn it ON/OFF, the information is sent from the remote to the PS3IRX1, through the wires and a slight charge onto the copper pieces which tricks it into thinking it was touched. If for whatever reason you are unable to power ON/OFF your PS3 with the remote start, re-adjust the thin copper piece. Conclusion : Overall, the PS3IR+PWR IR with Power ON/OFF is a great product. Installation is very easy, does not require any modification or tools. It doesnt even void your warranty. Setting up your universal remote is very easy and will work. Have problems or questions? The support that AVSForums as well as from Mike Muecke (owner/designer), provide excellent customer support. People are willing to help, give tips and Mike is there every step of the way until you get your problems fixed. Like the PS3IRX1 which is priced at $35.00, the PS3IR+PWR IR is priced at $50.00 and is a bit pricey considering you can get a PS3 Bluetooth Remote for $25.00 and even as low as $20.00. Hopefully, the price will go down. Even at $40, I think it would be more reasonable. Guests online: 465. Total online: 467.